Bristol University archaeologists are to survey the site of HMS Nymph, which sank more than 200 years ago in the British Virgin Islands. The Royal Navy vessel went down after a fire in 1783 and the survey aims to identify what remains are left. The two-week study will be conducted by a team of four archaeologists, led by Kimberly Monk of the Department of Archaeology and Anthropology. She said the area housed a unique cultural history above and below water. She added: "Many sites require years of detective work before identifying remains. "As a result, shipwreck sites such as HMS Nymph are a phenomenal opportunity. "They are a time capsule of material that allows us to expand our knowledge of colonialism, naval warfare, and 18th Century society." 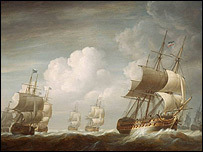 HMS Nymph was launched at Chatham Dockyard in May 1778 and served King George III's navy as a support vessel in the East and West Indies. In February 1969, dredging in Road Town Harbour revealed its remains. Artefacts were removed but there was no archaeological survey or site excavation.